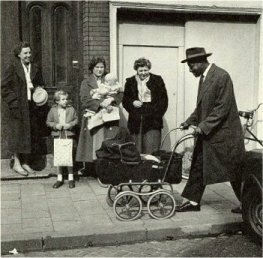 One Of The Stupid Pictures My Father Shot Of Big Bill Broonzy In Amsterdam. Now, just think about the fact my father was a photographer. All he did was hold a stupid camera in his stupid hands while he pushed with his stupid fingers on stupid buttons, and that is how he shot his stupid pictures. you are so funny. Your father must have made you laugh out loud. He liked picture books, right? Dunno about my father though. The only time I saw him beam was in his coffin.